Back in December, Warner Bros. pushed its highly-anticipated Aquaman movie by more than a year, from its original release date of July 27, 2017 to October 5, 2018. Production is reportedly set to begin this summer in Australia, under the direction of James Wan, but now it seems the studio is delaying Aquaman even further. The studio has pushed Aquaman from its October 5, 2018 date, to December 21, 2018. The Hollywood Reporter reveals that the studio is taking over the same date that Avatar 2 was originally scheduled for. Last week, James Cameron announced that his sequel won't hit that 2018 date as previously planned. 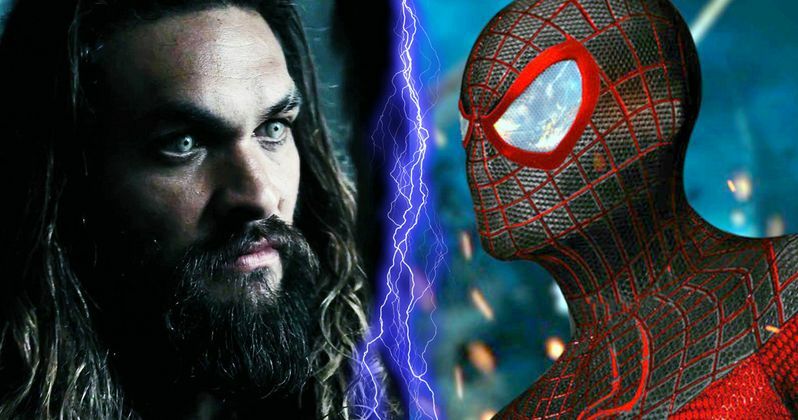 Right now, Aquaman will be going up against Sony's untitled animated Spider-Man movie, while falling between a few more highly-anticipated releases. Aquaman will arrive one week after Universal's Mortal Engines on December 14, and a week before Disney's Mary Poppins Returns hits on Christmas Day. This new Aquaman date marks the first time that a DC movie and a Marvel adaptation will open on the same weekend. Although the Marvel project is animated, and produced through Sony Pictures. There was almost a Marvel-DC box office showdown when Batman v Superman and Captain America: Civil War chose the same May 2016 release date, but Warner Bros. eventually budged, moving Batman v Superman to March 25, 2016, with Marvel keeping their May 6, 2016 date for Civil War. It hasn't been confirmed if this new release date means that production will be pushed back at all, but as far as we know, filming is still slated to commence sometime this summer in Australia. Another report surfaced in December that this superhero adventure is also eyeing a fall 2017 shoot in Erice, on the Italian island of Sicily. That report revealed that Erice mayor James Tranchida had authorized Warner Bros. to film some shots at the Castle of Venus. Before this news dropped, director James Wan had shared an Instagram photo of him riding in a boat off the Amalfi Coast. Jason Momoa will lead an Aquaman cast that also includes Amber Heard as Mera, Willem Dafoe as Nuidis Vulko, Patrick Wilson as Orm, Nicole Kidman as Aquaman's mother Atlanna and Yahya Abdul-Mateen II as Black Manta. There was also a recent report that the production was eyeing Temuera Morrison, best known for playing Jango Fett in the Star Wars prequel triloguy, to play Arthur Curry's human father, but it hasn't been confirmed if he has signed on or not. Warner Bros. still hasn't released any story details yet, and it remains to be seen how many more characters need to be cast. Director James Wan recently confirmed that the DC Comics character Aqualad will not show up in this movie. James Wan is directing Aquaman from a script by Will Beall, based on a story created by James Wan and Geoff Johns. Pre-production on this superhero adventure started in Australia back in November. Geoff Johns is also producing alongside Justice Leauge director Zack Snyder, Deborah Snyder, Peter Safran and Jon Berg, with Rob Cowan serving as executive producer. After making his DCEU debut in Batman v Superman: Dawn of Justice, Jason Momoa's Aquaman will next be seen later this year in Justice League, which arrives in theaters November 17.